Don't Delay! Order Today! Available while supplies last. Overstocked and ready to move. Great deal on a fantastic silicon nitride insert from Kennametal. Overstocked and ready to move. Great deal on a fantastic white ceramic insert from Kennametal. Save Big on HSS End Mills! Special Deals on Overstocked Drills. US Made. No. 4 Step Drill for Drilling and Counterboring Cap Screw Clearance Holes. Click on "more info" for product details. US Made. No. 10 Step Drill for Drilling and Counterboring Cap Screw Clearance Holes. Click on "more info" for product details. Only 1 left at this price!! Asimeto Inch Outside Micrometer. Click on "more info" for product details. Only 2 left at this price!! Asimeto Inch Outside Micrometer. Click on "more info" for product details. List price is $820.00! APT #SM816126. 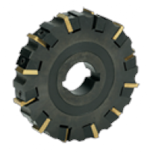 8" Cutter Diameter x .720-1.025 Cutting Width Range x .690 Cutting Body Width x 1-1/4" Arbor Diameter. Slot Master Adjustable Width Indexable Milling Cutter - Arbor Type. Uses CTA Inserts. Click on "more info"
Only 2 at this price. These are slightly used end mills and could be resharpened. US Made, QuickKut Carbide End Mill, 9/16" x 1-1/4" x 3-1/2". Click on "More Info" to choose coating and for product details.